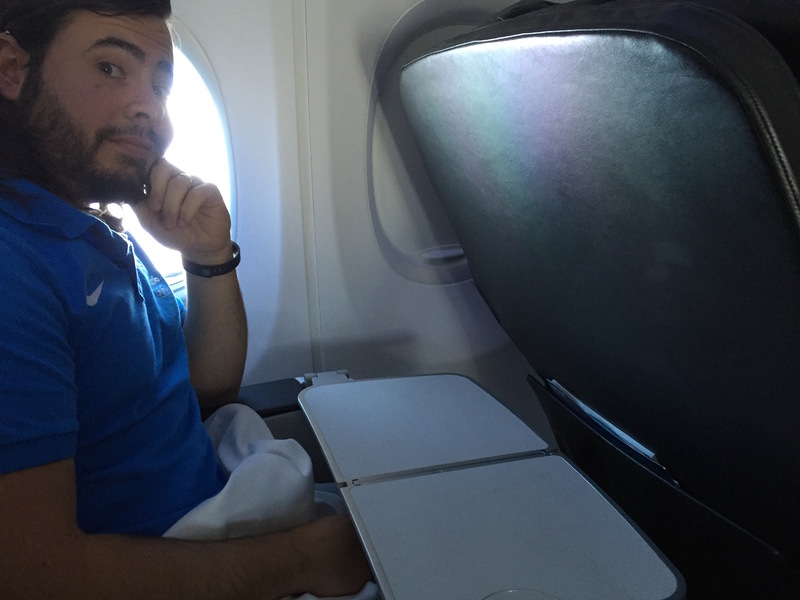 Flight 1 of 10, Alaska Airlines SEA-SFO, #NMCLaborDay | No Mas Coach! It’s the first flight of the #NMCLaborDay adventure, and we couldn’t be more excited. 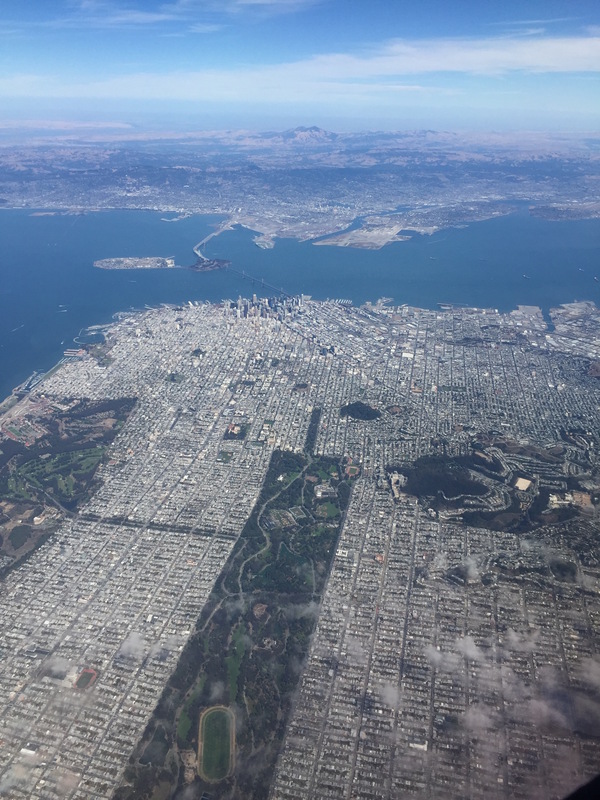 As you may have read on the main post, we had to position ourselves to San Francisco to take advantage of the discounted business class tickets. After a quick stop in the lounge, we headed to the gate to board. As is usual for Alaska (for whatever reason, I don’t know…) they board around 45-50 minutes before the flight is supposed to take off. This results in everyone getting on to the plane and waiting around 15-20 minutes inside the aircraft. I suppose that it’s good to get everyone onboard and that way you make sure that you get an on time departure, but it seems a bit extreme to me. As we approached the boarding line, the First Class/MVP line was empty and the Main Cabin line was full, so we approached via the FC line. Even though we were waiting there, she did take around 4 more people in the main cabin line before she took us. I gave her a glare, as if to say “hey, we’re over here…” and then she told the other passengers to wait while we boarded. In the end, since we boarded so early, we all ended up standing in the jet bridge anyway! We were greeted at the door by a smiling Darlene, who would be our first class attendant for the flight. Once we took our seat she came by to formally introduce herself and let us know the flight time, takeoff time, and take food orders. This flight had on offer a “grains salad with tasty chicken on top and a large piece of garlic bread, it’s yummy.” One problem. Ben doesn’t eat chicken. For those of you about to chastise us for not pre-ordering meals ahead of time to save the embarrassment of not getting your meals selection, NEWS FLASH! Alaska doesn’t allow any special meals at all. That’s right. No Kosher, no Hindu, No Vegetarian, No low sodium… nothing. You get chicken salad. 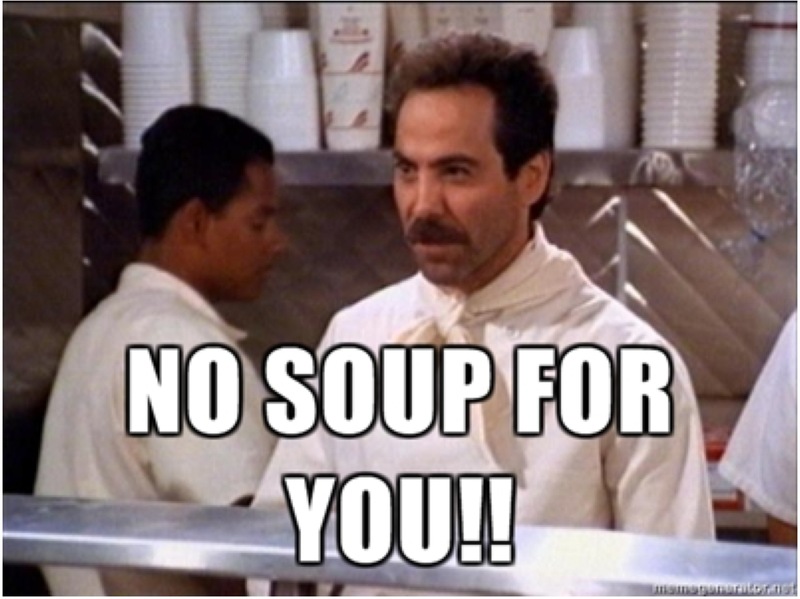 If you don’t like it, NO SOUP FOR YOU! In the past, Alaska would allow premium cabin passengers to take a fruit and cheese plate or snack pack from the back in case their selection was not available. This all changed a few months back when Alaska instituted one of the least customer-focused policies that I’ve run into. It’s affectionately called “the leftovers policy.” In other words, the standing rule is “we can get you that cheese plate, but only after we’ve tried to sell it to the entire economy cabin. If you want it ahead of time, that’ll be $8. 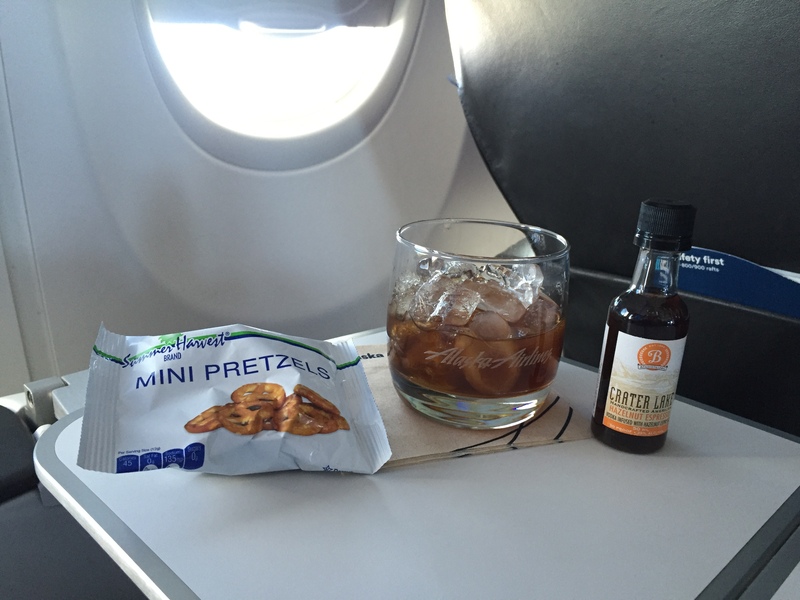 Once we’ve gone through the whole service, if we have any leftovers we can bring you some.” In the meantime, as you’re watching all of your fellow first class passengers eat their meal, have some pretzels to tide you over. We hope to be able to serve you in about 45 minutes. To make a premium class passenger wait for almost an hour for the other attendants to finish a cabin service, only to MAYBE have something for them to eat is just unacceptable. #FirstWorldProblems, I know… but if we’re being honest, and I’ve paid a 2x or 3x premium for this cabin, I shouldn’t be charged for asking for an economy meal. 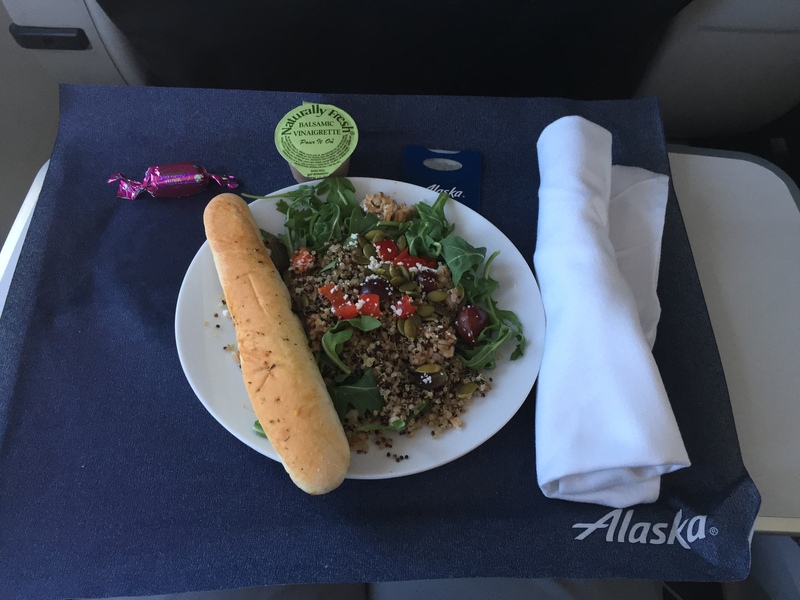 All other airlines offer the ability to select your meals ahead of time, and in my opinion if Alaska wants to compete with the big boys then this is one policy that they should look into changing, ASAP. As I was writing this post, Darlene came by with what I consider to be one of the BEST parts of flying Alaska. For the uninitiated, the Crater Lake Hazelnut Espresso Vodka is the best kept secret on Alaska. They partnered with Crater Lake liquors out of Bend, OR years ago, but most people don’t even know it’s on offer. In fact, when we started flying Alaska 2 years ago, they only stocked 1 or 2 bottles on each flight because no one was ordering it. I’ve had my fair share on flights now where I’ve emptied their inventory, and I can say that they’re properly stocking flights now. Maybe it was because of me, maybe not ☺ But thanks, Alaska! 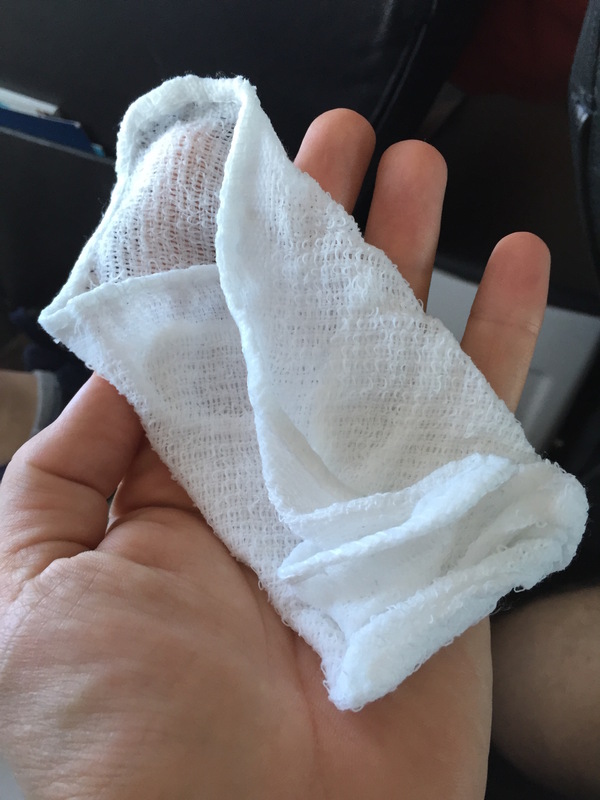 Hot towels were promptly distributed, which we usually use to wipe down our tray tables. Darlene did her best to accommodate the non-chicken request, so here’s Ben’s food, and mine. At this point we were about 40 minutes out and BOOM sure enough, the lady in 1A decided to recline into Ben’s seat. Yea, no leg room when you recline! Space is not an easy thing to come by on Alaska’s planes. 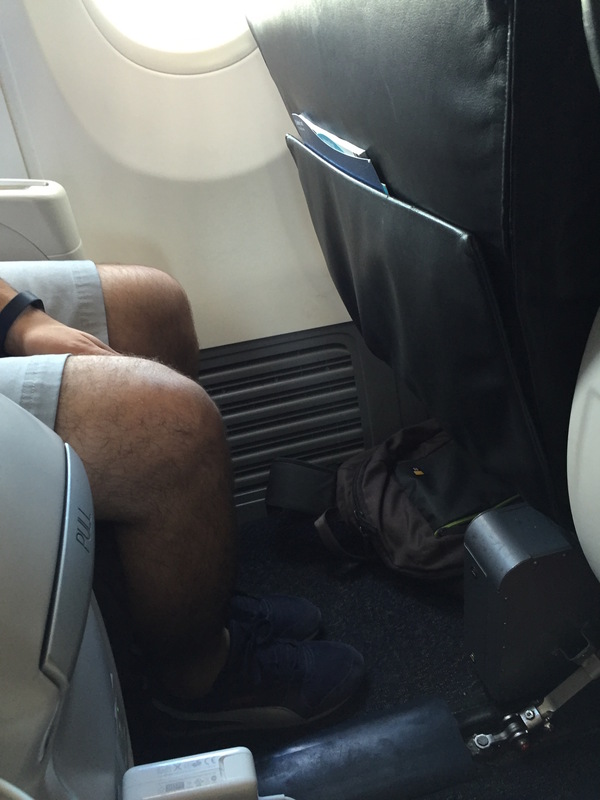 Usually when we fly we opt for the first row because once someone reclines into your space, you’re screwed. The space between the seat in front of you and the middle divider is impossible to pass without some cirque de soleil moves. I actually think it’s easier to get out of the coach seats when someone reclines. Luckily, this was just a short flight and it was almost over. With that said, landing commenced and we were on our way to the gate for a short layover in San Fran. 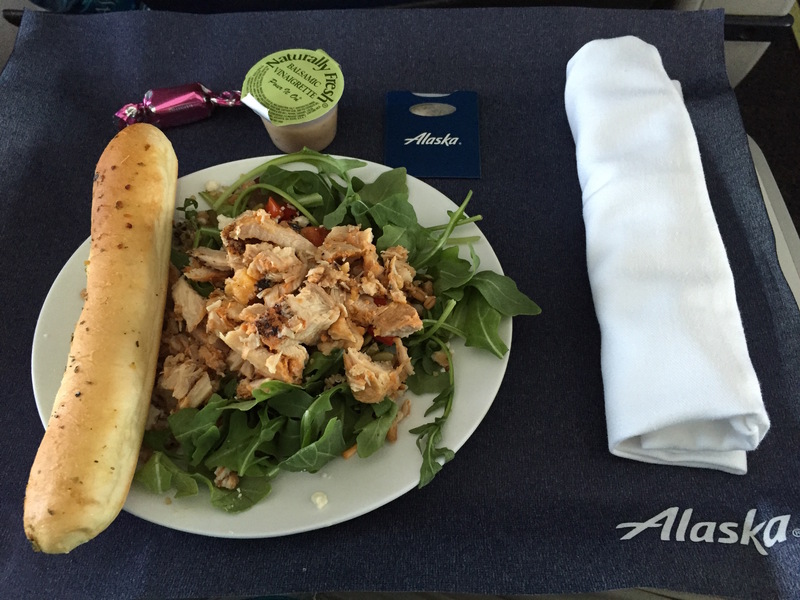 Alaska offers a consistent experience in First Class. That isn’t to say that it’s awesome, it’s just consistent. At the end of the day what makes or breaks a flight for us is the service from the staff. Alaska has some of the friendliest staff and crew that we’ve run into, and Darlene was no exception. You could truly tell that she likes her work. You could also tell that she was truly apologetic that she wasn’t able to get us a non meat dish because of a backwards ridiculous policy that’s in place. 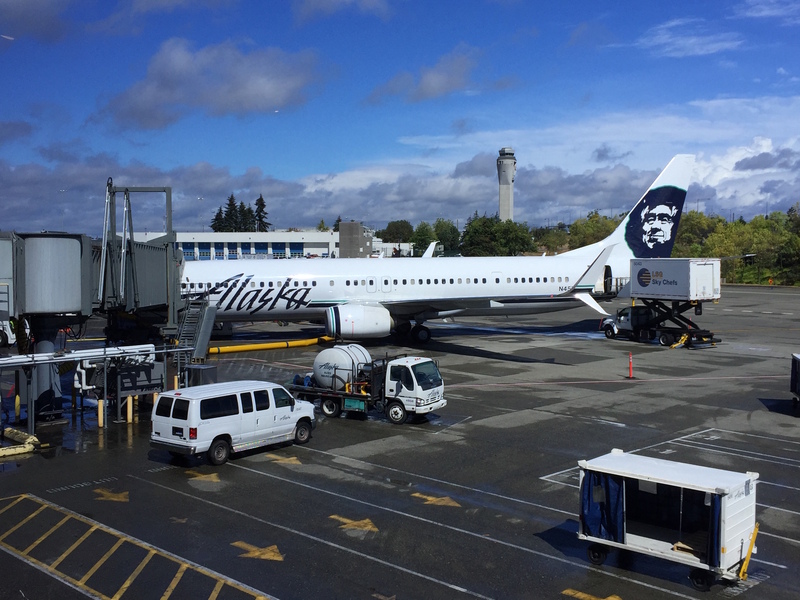 I’m really curious to see how Alaska’s service matches up to our return from San Fran as we try out Delta’s short haul service. What are your thoughts on Alaska? Have you flown them in first class before? Love Alaska. MVP 75k and will be for next year! Congrats. Are you based in Seattle? I disagree with you about the BOB for first class argument, but we’ll discuss later 😉 I think the bottom line is AS needs to offer more than one option. Period, there’s no excuse! Even the crappy big 3 usually offer a veg option. They do. Especially in Seattle (and soon to be SFO) with all the picky food habits people in these cities have.